This training is designed to suit anyone involved with the marketing or sales of UC, Hosted PBX and/or SIP trunking such as: Manufacturers of IP PBX and IP Phone equipment, SIP security manufacturers, SIP Trunk/Hosted PBX service providers and Carriers, Networking Design specialists, Sales and Management personnel working with VoIP equipment and services; all of these will benefit from this program. Please note that even with an initial focus on the UC, Hosted PBX and SIP trunking market in the USA, the course principles are applicable to service markets globally and other examples regarding other counties will be included over time. Once you’ve purchased an access licence for this course you’ll have access to three modules. You can work through the modules in order or simply choose the ones you are most interested in. Please note that the SSCA® training course is designed to teach all of the technical aspects of SIP that are not in the scope of this course and can be purchased separately on this site. 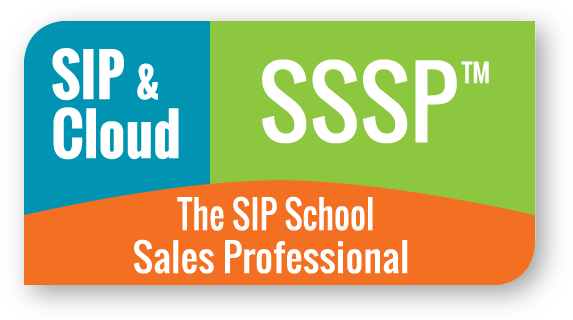 The SIP & Cloud - Advanced Sales training program is accompanied by the SSSP™ certification test.